“WAIT Is a Four-Letter Word” from Christian Faith Publishing author Stephanie Arceneaux is a lighthearted book generously laden with insight on how Christians have not escaped the fast-paced, impatient, “microwave” direction society has taken; but God has a better plan, intending to teach his children to be patient and wait upon him—a difficult process that brings the author face to face with her own impatience time and again, often with unfortunate consequences. “WAIT Is a Four-Letter Word”: a wise, funny book about God’s infinite patience, and the author’s lack thereof. “WAIT Is a Four-Letter Word” is the creation of published author Stephanie Arceneaux, a certified school teacher, former foster care caseworker, and married mother of twins who resides in Nederland, Texas, with her husband of fifteen years. Arceneaux shares, “Remember when you were young and there were certain words that you were forbidden to say because they were considered bad words? The words your parents did not want you to hear so they covered your ears. Or the words they definitely did not want you to say and if you did, they would threaten to wash your mouth out with soap. Well, if you think about it, most of those words were four-letter words. Without being offensive and discrediting myself as a Christian, I’ll give a mild example. H, E, double hockey sticks. Does this ring a bell? Published by Christian Faith Publishing, Stephanie Arceneaux’s new book is a timely, relevant testimony of the author’s personal journey, which in its honesty and compassion, reflects the state of many Christians’ conflicted relationship with the Lord. The author offers through her story the greatest insight illustrated time and again: that God has a purpose and can be trusted to fulfill his promises—all in good time. View a synopsis of “WAIT Is a Four-Letter Word” on YouTube. 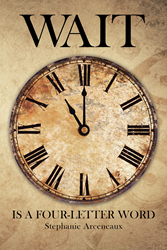 Consumers can purchase “WAIT Is a Four-Letter Word” at traditional brick & mortar bookstores, or online at Amazon.com, Apple iTunes store, or Barnes and Noble. For additional information or inquiries about “WAIT Is a Four-Letter Word”, contact the Christian Faith Publishing media department at 866-554-0919.